Clearly I was not the only one who enjoyed Black Northcott’s ALL NEW FATHOM miniseries last year. 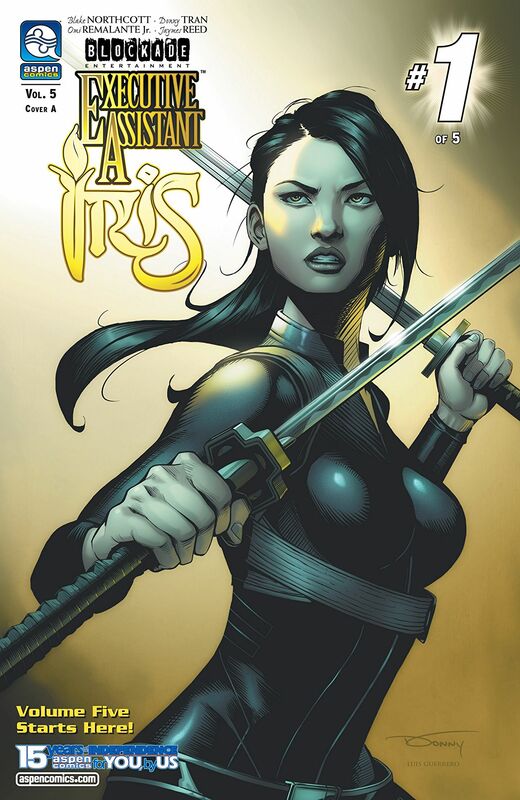 The people in charge of ASPEN COMICS must have liked it too, as they have given Blake another chance to script a miniseries about one of their female characters. Honestly, I’d never even heard of this character before Blake announced her involvement in this series. But this is listed as volume 5, so this character has been around for awhile. But once again I do no prior research on the character before reading this, as I wanted to go in “blind,” in order to judge Blake’s ability to make this story accessible to new readers, as she did so well with Fathom. So, lest you think this story is about a woman working as a secretary in some office, the title “Executive Assistant” is some kind of code for a “covert bodyguard/assassin.” That’s what Iris does. We’re not given much of her background, other than that she is an exceptionally skilled martial artist, both hand-to-hand an in the use of several weapons, who has been in this line of work for awhile. While still good at her job (we open in Germany, where we see her foil a kidnapping attempt against her latest client, an arrogant rock star), she worries that time is catching up with her, that she’s not longer as fast and effective as she was when she was younger. Then the main focus of this issue is on a private security company called Magni Global. They specialize in providing security for some of the biggest corporations and richest individuals in the world. This is a particularly interesting concept, in my opinion. It makes sense that in this type of “superhero” universe, like those of Marvel and DC, where super-beings, aliens, monsters, etc. are known to exist, the private security business would be bigger than ever. High profile rich people and celebrities (and politicians) would need bodyguards who who are equipped to deal with such dangers. So that’s what Magni Global does, they’re said to be the biggest organization of their kind in the world, and, at the urging of a new potential client, they seek out Iris and attempt to hire her. Despite her initial lack of interest, and desire to remain freelance, Iris agrees to meet with Magni Global and is given a tour or their headquarters as they make their pitch to her, to get her to join their team. Iris is shown around by a rep for the company, as they show all of the resources that Magni Global has, which will be at her disposal if she works for them. There are some call backs to Blake’s Fathom series, as references are made to the Typhos attack on Australia, and it’s revealed that Magni Global has even cut deals with The Blue, in order to utilize some of their high-tech weaponry. But it’s all written in such a way that you don’t have to have read the Fathom series to follow along, it’s just an extra treat if you have. That’s basically the plot of this first issue. And although it is largely a “talking heads” story, Blake’s knack for writing natural-sounding dialog helps the story flow and keeps you engrossed until the end. The issue is mostly set-up, but feels like a traditional origin issue in that it sets up the status quo for the main character. She ends up taking the job (Spoiler Alert, I guess), so Iris is now working for Magni Global, and meet her supporting cast, including the enigmatic owner of the company, Alexander Magni III, and Mackenzie Holland, a young woman assigned to be Iris’ partner/sidekick.